By exporting missile technology to Iran, China is effectively arming Syrian forces and exacerbating the civil war. Since the imposition of sanctions against Iran, 31.7 percent of arms exports to that country, representing a worth of $4.25 trillion, have been supplied by China. China’s deliveries to Iran have primarily consisted of HongQi-7 surface-to-air missile (SAM) systems and Crotale R440 SAMs. Only Russia delivered more arms to Iran; no other nation came close to matching that figure. What’s more, Iran is second only to Russia in supplying arms to Syria, and from 2000 to 2014, 85 percent of the value of those arms came in the form of air defense systems and missiles. In other words, Russia and China are the largest suppliers of air defense systems to Iran, while Russia and Iran are the largest suppliers of such systems to Syria. And because Iran is in cooperation with Syria regarding ballistic missile technology, by arming Iran China is effectively arming Syria too. It’s no secret that Syria and Iraq are, as one writer observes, “awash with Russian, Iranian, and Chinese weapons.” Nor is it surprising that Syrian rebels have been found using Chinese missile technology. But this wasn’t a calculated outcome by the Chinese; it’s an unavoidable consequence of being one of the world’s biggest arms dealers. However, China does have a choice when it comes to supplying Syria by proxy. 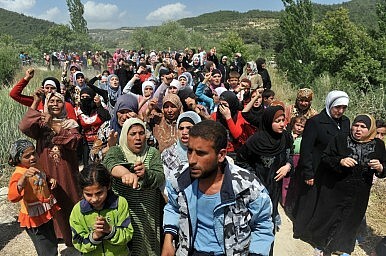 Syrian President Bashar al-Assad has become responsible for the deadliest massacres of the Syrian Civil War. From January to July, his forces killed 7,894 people. That’s roughly seven times the number of people killed by the Islamic State during that time, which implies that the Syrian refugee crisis isn’t being caused by the Islamic State but by Assad’s bloody attempt to stay in power. Yet, unfazed by this bloodshed, China’s shop door remains open. The West finds itself frustrated by Chinese foreign policy pragmatism, or as the critics would have it, the absence of values. This is de facto incompatible with Western moral ideals, which invoke human rights or other ethical arguments. Chinese realpolitik is seen as amoral, if not immoral. This doesn’t mean China is coldly indifferent to the suffering of Syrians. On the contrary, in June 2014 China donated $16 million in humanitarian aid for Syrian refugees. Rather, China prefers that other countries not meddle in its domestic affairs so it practices an ethic of reciprocity. But the accusation that the U.S. is skirting its responsibility is lazy propaganda at best. The U.S. has contributed $4.11 billion in humanitarian aid for Syrian refugees, and more importantly, it isn’t indirectly supporting the man responsible for this crisis in the first place: Assad. I’m not opposed to Chinese non-interventionism. I simply have a problem with claiming to practice non-intervention while selling more arms than almost any other country in the world, including to some of the nations involved in the conflict, then talking about who’s to blame while accepting no blame yourself. China's strategy in Syria aims to advance global acceptance of Beijing's non-interference policy.